Raising chickens is a rewarding experience in many ways. They can be delightful to have around, and fresh eggs are a welcome addition to the daily menu. If you have chickens, however, you’ll need to protect them from a variety of predators that want to eat them and their eggs. Chicken coop security begins with making sure you have a well-made chicken coop and run. Chicken wire isn’t sturdy enough to deter most chicken predators. Hardware cloth is much stronger because it’s made of steel wires that are woven or welded together and coated with zinc (galvanized) to keep it from rusting. Bury it at least a foot into the ground to prevent tunneling, or bend it outward for two feet around the perimeter to provide a ground barrier. Unless your chicken coop has a concrete floor, it needs to be built up off of the dirt. Wood that’s in contact with the ground will rot eventually, allowing gnawing animals to tunnel into the coop. All vents and windows should be covered with heavy gauge hardware cloth. Use galvanized washers and screws to secure it because some animals can work staples loose over time. Securing your chickens inside the hen house at night will protect them from nocturnal predators. As long as the structure is built to withstand entry by chicken coop predators, this is the safest place for your flock. Below is a grouping of the most common predators and an explanation of the best methods to keep them away. Your own dog can be a helper by chasing off any predators brave enough to approach the chicken coop. Other people’s dogs and strays might decide to pursue your chickens, ducks, and geese. Although they’re unlikely to eat your fowl, they could easily injure or even kill them while practicing their hunting skills. Unfortunately, other humans can also be a threat. Getting started raising chickens is a costly undertaking and some people try to supplement their own flocks by taking chickens from other coops. You also want to protect your flock against vandalism, so it’s a good idea to padlock the chicken coop at night to take away that temptation. Don’t allow any dogs near your chickens unless you know that they’re trained to leave them alone. Fence the area if you can because a fenced yard is the best way to keep away stray dogs. At night, be sure to remove any pet food and standing water that may provide food or drink for strays. Keep the hens inside the coop at night with a secure padlock on the door. Indoor and outdoor cats both hunt birds when they have the chance. It doesn’t matter how well-fed they are because this is driven by instinct. You’ll be able to tell if the culprit was a domestic cat because there will be feathers scattered around the area where the attack took place. Usually, there will also be bits of skin with feathers attached and bones with bite marks on them. Bobcats are about twice as big as a domestic cat. They often hunt at dusk and dawn, but they hunt during the day as well. You may or may not see evidence of a bobcat kill since they usually either consume the whole bird or carry the carcass away. A bobcat can carry off a couple of chickens in one night. House cats can be hazed away from attacking chickens to a certain extent. Squirt them with a water bottle whenever they try to chase the birds to train them that chickens are off-limits. Trim and mow the area surrounding the chicken coop and run to remove hiding places for stalking cats. Leaving a dog in the yard at night can keep bobcats away, but this isn’t a feasible solution during the cold months unless you provide the dog with a heated house. If there’s a persistent bobcat problem, you may have to contact the local fish and game department to relocate or exterminate the animal. Wolves only prey on domestic flocks when food is very scarce, but coyotes and foxes are common pests. Both of these predators hunt during the day as well as at night. Coyotes sometimes mate with wild dogs, and the hybrids are more likely to attack chicken coops than the purebred animals. They usually hunt in pairs and sometimes in packs. Several coyotes can decimate a chicken population overnight, and they’ll hunt when the opportunity arises, even if they’re not hungry. Foxes will attack and carry away chickens, and they also eat eggs. 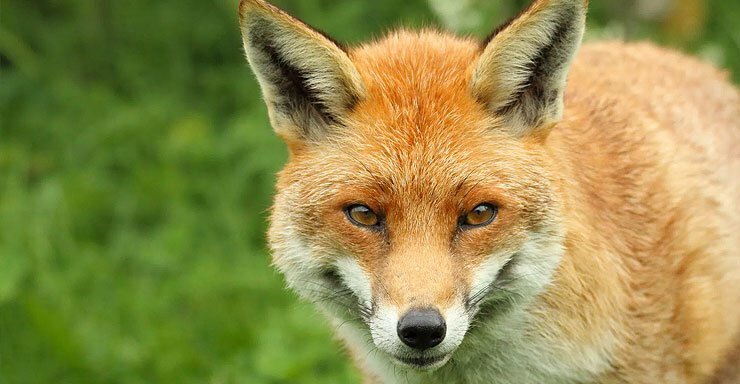 Red foxes are especially avid chicken predators. Foxes have dens inside hollow trees, old logs or in places they’ve dug in the ground. Like coyotes, they kill the fowl and drag it away to be eaten, usually in their dens. Like other canines, coyotes are skilled at digging. If you’re having problems with coyotes, a two-foot hardware cloth apron will keep them from digging their way into the coop. Wolf urine is an effective deterrent, but it’s expensive and needs to be reapplied often. Wait until the sun is up to let the chickens out of their coop since a fox may be lying in wait. At irregular times during the day, walk around the area where your chickens congregate to scare away coyotes and foxes. Rats will chew their way into a chicken coop if given a chance. They usually eat eggs and attack chicks, but if food is scarce they’ll attack grown chickens. Feed needs to be well-protected or it will attract them to the coop. They kill by biting the head or neck of the chickens. Weasels include ferrets, and they’re sometimes small enough to fit through a 1/4 inch opening in a fence. They’re long and skinny, and they wrap themselves around their prey and kill them by biting their necks. Weasels have to eat four times their body weight daily, and they can be voracious predators. Weasels instinctually kill as much as they can and save food for later. They will continue killing inside a chicken coop and can demolish an entire flock overnight. Build your chicken coop off the ground. Otherwise, rats will dig tunnels and come up under the flooring, leaving a way for weasels to enter. Inspect for rotted wood and gnawed holes in the coop regularly. A flattened metal food can will work as an effective barrier when doing repairs. Use quarter-inch hardware cloth on all windows and vents. Remove food and water from the chicken run at night and eliminate any other sources nearby, like pet food or water bowls. Raccoons, skunks, and opossums are nocturnal animals and they hunt at night. These predators will attack the flock and consume all the eggs in a henhouse. They’re attracted to uncovered garbage and they’ve expanded into many rural and urban areas. Raccoons are scavengers that hunt in packs, and they can kill off an entire flock in one night. Skunks also feed after dark, and they may kill one or two fowl and maul many others during a night’s work. They have a well-developed sense of smell and are effective at digging. Although they’re members of the weasel family, they’re like raccoons in that they’re attracted to garbage and pet food that’s been left outside. Opossums usually eat eggs and attack small chicks but they’ve also been known to attack adult chickens. Opossums love cat food and, as a matter of fact, it’s a dietary staple of tame opossums. They also dig through garbage to find a meal. They’re omnivorous animals that eat bugs, snails, rodents, berries, and seeds. If you have a bird feeder with seeds spilled on the ground, it can attract opossums to your chicken yard. To keep these scavengers from attacking your flock, tightly seal all garbage and remove water and any type of food from the area. This includes pet food and overspills from bird feeders. Keep small chicks in a brooder box that is reinforced against predators. If the problem is persistent – add paving slabs around the perimeter of the coop and run in addition to the buried hardware cloth. Hawks have keen eyesight and will wait until they spot a chick or bantam bird that’s away from the rest. They swoop in quickly and grab the prey with talons that are strong enough to kill instantly in some cases. When chicks or birds are missing with no other sign of predation, a hawk may be the culprit. The Great Horned Owl is the type of owl that preys on full-grown poultry. These predators hunt mostly at night with chickens, ducks and other birds as their prey, along with a variety of small animals. They do hunt during the day, though, and free-range chickens are more at risk. There’s less to worry about with barn owls and screech owls because they generally don’t bother flocks. As much as possible, get rid of any places that birds of prey can use to perch. Eliminate old logs, dead trees, rotted fence posts and any other unnecessary clutter from around the chicken coop area. Keeping the poultry inside the hen house at night is a prime method of securing your chickens. To train them to go inside, offer an indoor feeding at dusk and then lock them in. Remember that hawks and owls are protected species and don’t use any methods that would trap, injure or kill them. For free-range chickens, use a trained guard dog to provide protection from birds of prey. Snakes can enter through small openings, but they also need to be able to retreat through those openings after eating. That’s one reason they mostly go after eggs and small chicks. Snakes have the advantage of being able to go under or over fencing, and they’ll be drawn to a chicken coop that’s infested with mice. A snake will also enter a hen house during the day and hide under bedding until its nighttime hunting session. To keep snakes away, be sure and keep all feed securely sealed to deter mice. They can be an added draw for the reptiles. Check the nesting boxes, coop and run for snakes before locking up for the evening. Collect eggs daily to remove the temptation. Keep the area around the coop free of tall grass, branches and other debris where snakes can hide. Use the smallest gauge wire on all ventilation and other small openings for better chicken coop security. Try natural remedies like cayenne pepper, cinnamon and garlic juice around the perimeter of the coop. These will repel many types of predators. Following these guidelines for construction of your hen house and run will be a helpful first step in chicken coop security. The tips concerning various chicken coop predators will assist you in keeping them away from your flock. It’s not hard to develop routines that will keep your chickens safe, like feeding inside the hen house at dusk and locking them in for the night. Certain dog breeds are especially adept at protecting chickens, and so are roosters and even llamas. With all of these resources available, you should be able to keep your flock safe and content while you reap the benefits of raising chickens.